Remove the balancer shaft. 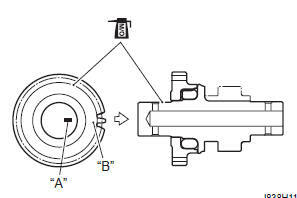 Refer to “engine bottom side disassembly” . Remove the washers, balancer gear and dampers from the shaft. apply molybdenum oil solution to each part. Set the dampers and install the balancer shaft to balancer gear. fit the stopper of the balancer shaft between the dampers. Align the line “a” on the balancer shaft with the punch “b” on the balancer gear.